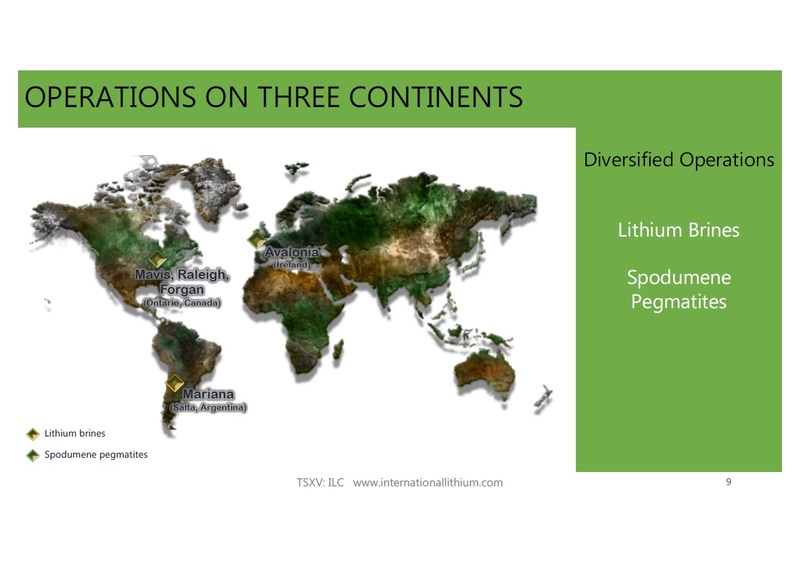 International Lithium Corp. (ILC) is a lithium resource exploration and development company. ILC has a significant portfolio of projects, strong management, and a strategic partner and key investor, Jiangxi Ganfeng Lithium Co. Ltd. (“Ganfeng Lithium”), a leading China-based lithium product manufacturer. Ganfeng Lithium has a 16.29% ownership in ILC (or 11.43% if all convertibles convert). ILC currently owns stakes in highly prospective projects in the most prolific areas of the world for lithium and rare metals. 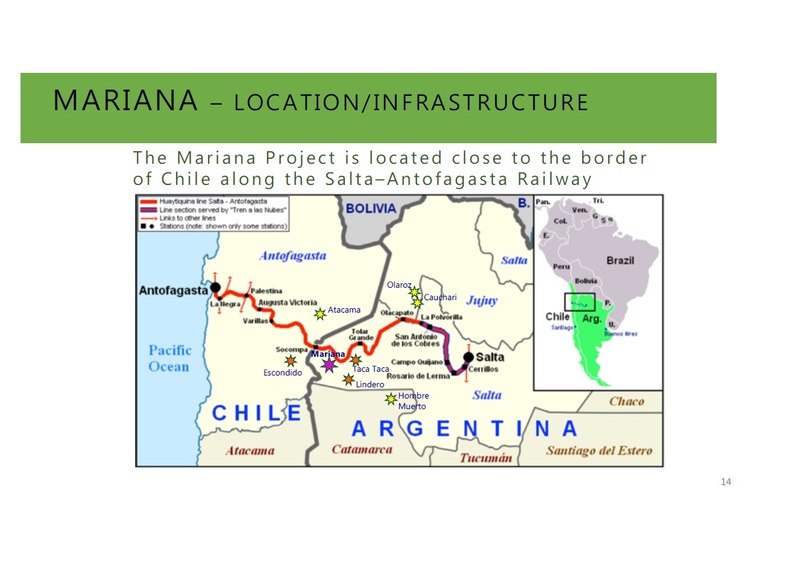 ILC and Ganfeng Lithium have been jointly working on developing the Mariana Lithium Brine Project in Argentina and the Avalonia Lithium Pegmatite Project in Ireland since 2014. 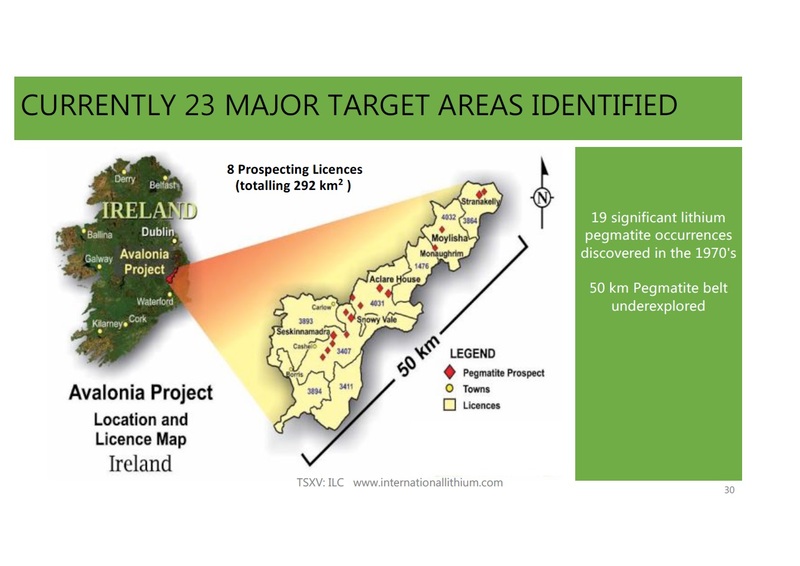 The Company's primary strategic focus is on the Mariana Project in Argentina (brine) and on the Raleigh Lake Project in Canada (hard rock), also complemented by further hard rock projects in Canada (the Mavis Lake Project) and Ireland (the Avalonia Project). Ownership: 82.754% Ganfeng Lithium (GFL), 17.246% ILC, ILC retains 10% back-in right, i.e. the right to acquire a further 10%. The mineral rights (all in Argentina) strategically encompass an entire salar or 'salt lake' basin in the “Lithium Triangle” of Chile, Argentina and Bolivia. This region is host to the majority of global lithium resources, reserves and production. 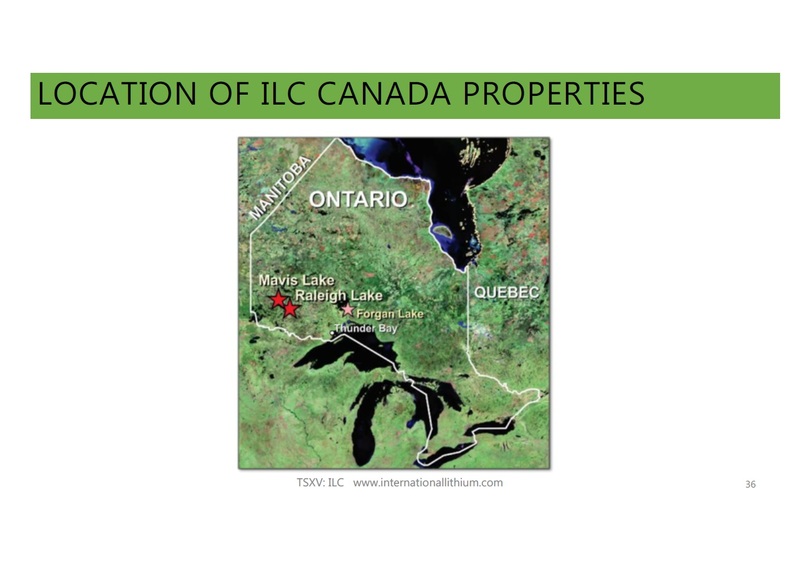 The Raleigh Lake project is now regarded by ILC management as ILC's most significant project in Canada. ILC will be conducting further magnetic drone surveys and drilling in the next few months with the goal of validating its hopes for the potential of Raleigh Lake. There will be a Canadian flow through financing opportunity on this project. Drill hole MF11-12 returned 1.86% Li2O over 26.25m and 1.22% Li2O over 28.45m. On September 10, 2018, International Lithium announced that it has reached an agreement to sell its Forgan Lake mineral rights to Ultra Lithium Inc. (TSXV: ULI). ILC will receive a 1.5% net smelter royalty on future production, both from Forgan Lake and from an adjoining property owned by Ultra Lithium. Mr. Wisbey became an investor in ILC in 2015, joined the board as Deputy Chairman in 2017 and became Chairman and CEO in March 2018. He has acted as a public company Chairman, CEO or Director for eighteen years. He is an ex-banker at Kleinwort Benson (including 5 years in Hong Kong and Singapore) and a technology entrepreneur. He founded two London AIM listed companies; IDOX plc and Lombard Risk Management plc. He also established CONVENDIA Ltd., a software company specializing in cash flow and revenue forecasting, and has become active in the digital asset space with investments and board positions in crypto trading platforms and crypto custody. Mr. Wisbey was also Deputy Chairman of the Company's former parent TNR Gold Corp. until January 2018. He is a graduate of Cambridge University. Mr. Brooks is a licensed senior statutory auditor in the UK. Since 2000, he has been a senior partner in Johnson, Smith & Co., Chartered Accountants and Statutory Auditors. Mr. Thompson is a speaker and expert in marketing behavioral science. In 1995, he founded Giftpoint Ltd. Mr. Thompson was President of IGC Global Promotions. Mr. Klip is Chairman, CEO and President of TNR Gold Corp., ILC's former parent. The company's stake in ILC is now down to 4.1%. Mr. Kovacs has over twenty-two years experience in mineral exploration and development. Before joining ILC, he held senior management roles developing iron ore and industrial minerals projects. Prior to that Mr. Kovacs worked for Anglo American, where he was directly involved in several new discoveries internationally. Ms. La Couvée has over twenty years of experience acting as Corporate Secretary of a number of public and private internationally focused companies in the resource sector. Mr. Pirzada has over thirty years of experience in mineral exploration and mining with specific expertise in lithium, rare earth elements, graphite, PGE and uranium. He was previously President, CEO and Director of Rock Tech Lithium. Mr. Davies has over 20 years experience of building technology applications gained at JP Morgan and as CTO of Lombard Risk Management plc. He is also CTO of CONVENDIA Ltd.
Dr. O'Sullivan is responsible for investor relations at International Lithium and also for corporate communications and assisting the CEO with capital strategy. She has a background in investor relations gained at Standard Chartered Bank and also at Friends Life Group where she was head of investor relations. 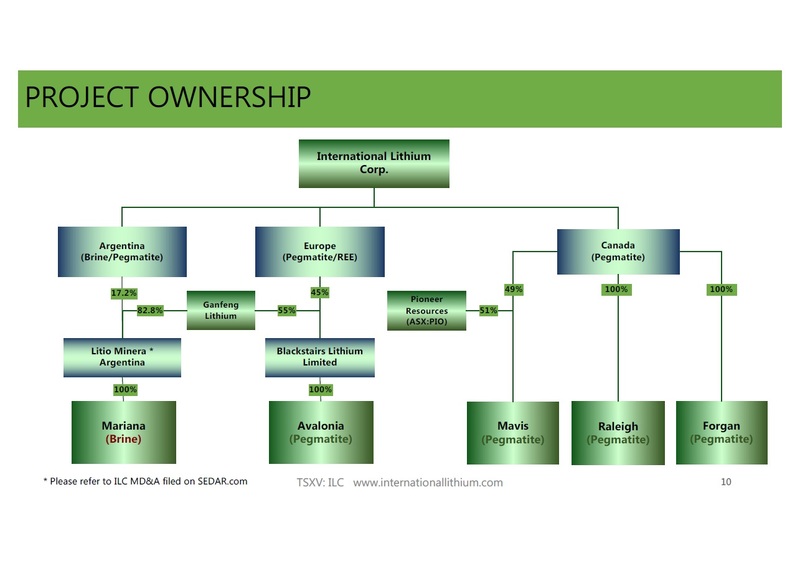 On December 11, 2018, International Lithium Corp. announced that it will conduct a private placement of up to 50 million units at a price of five cents per unit for gross proceeds up to $2.5-million. The proceeds of the private placement will be used for exploration on the Company's Raleigh and Mariana projects and for general working capital purposes.